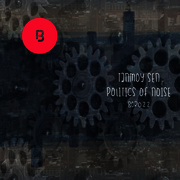 Buena Onda Records goes on exploring the Eastern side of the Techno World with its latest release "Politics of Noise" and a collaboration with a newcomer on the Indian Techno scene : Tanmoy Sen. The emergence of the Indian underground techno scene is undoubtedly the best news of these past years, which brought its lot of amazing talented deejays with interesting & rich background on their bag. These guys rock the scene. Some prefer to stay on fundamentals? Right ... Buena Onda has chosen once again to explore the future world of electronic music. Solid producers & remixers are on stage, first our Chicago techno warrior "Jerome Baker" who's released several maxis on well known legendary labels like & to name The One: "Relief Records". Second remix is done by Rocco Caine, another incredible techno banger who has released tracks on the prestigious Adam Bayer's label "Drumcode". To complete the menu, the magic duo "Falling Cows" aka Breger & Moog Conspiracy, two young crazy boys under footlights who share all their time between Berlino & Goa & to conclude this huge EP Buena Onda label headhoncho, Gurwan. Rocco Caine Music is dope ! thanks for the promo ! Rocco Caine & Falling Cows Remix for me. Thx..
Great EP, love all teh sounds from Buena Onda!! Nice releases! Thanks for the promos! Like the Rocco caine rmx and falling cows remix a lot. Nice Rocco Caine remix for me. Rocco Cane Remix rockzzz! full support.. thank you! Rocco Caine remix for me! Will try track 6, thanks! Rocco Caine Remix for us .. Thanks!! rocco caine remix for me. support. cool stuff in between! like 1 & 3 most!